Construction plans and suggestions for a homemade telegraph. Serves as a good application for studying electromagnets. Simple homemade telegraph by erasei at YouTube. Fig. 1:Homemade telegraph plans from the May 31, 1931 issue of Telegraph, as reproduced by Science Service. Fig. 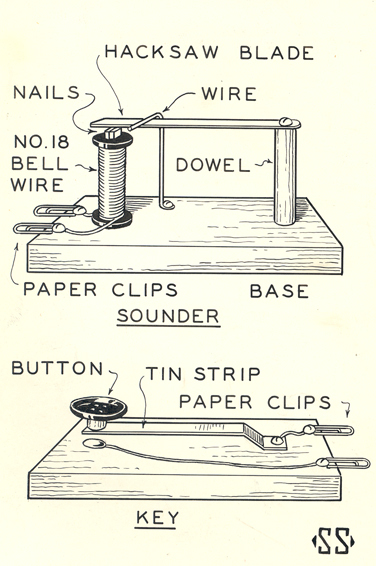 2: Telegraph sounder made from bolts, paper clip and wire. Fig. 3: Detail of sounder. The paper clip is suspended about 1 mm above the electromagnet. Fig. 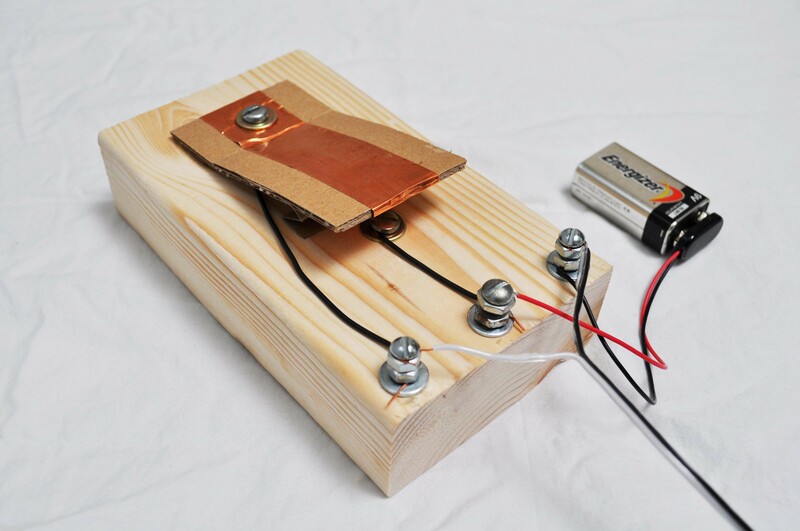 4: Homemade switch and battery used as a telegraph key. Pressing on the copper-coated cardboard switch makes a connection with the bolt head underneath. Fig. 5: Detail of the telegraph key showing the head of the connecting bolt underneath. A business card has been folded accordion style and put under the key to act as a spring. The video above by erasei shows one of the simplest telegraph systems I've ever seen, using a paperclip switch, a 9V battery, and a coil of magnet wire wrapped around a nail. When the switch is closed, an electric current runs through the coil of wire, turning it into an electromagnet. The coil magnetizes the iron nail, which pulls the steel arm on the left down to the head of the nail to make an audible click. Several versions of the telegraph were invented in the 1830's and 40's, the most popular by Samuel Morse (see history below). Morse, together with Alfred Vail, also developed the code to be used by the telegraph, which assigns a sequence of dots and dashes to each letter in the alphabet. A trained telegraph operator could listen to the clicking of the receiver and decipher the text in real time. Simple homemade versions of the telegraph have been around for decades. Figure 1 from the May 31, 1931 issue of Telegraph (as reproduced by Science Service) shows plans for a homemade telegraph of the time. My own version of the telegraph is no different in principle, though built for slightly heavier duty and longer distance. The sounder is shown in figure 2. The electromagnet is comprised of a 2.5 inch #14 bolt that is wound four layers deep with 30 gauge plastic coated wrapping wire, giving a density of about 130 turns per inch. (Enamel coated magnet wire would allow slightly denser windings and would probably work a little better.) A paperclip wire is suspended from another bolt to act as the sounding arm. (A hack saw blade would also work very well.) The separation between the paperclip and the electromagnet is only about 1 mm (see figure 3). 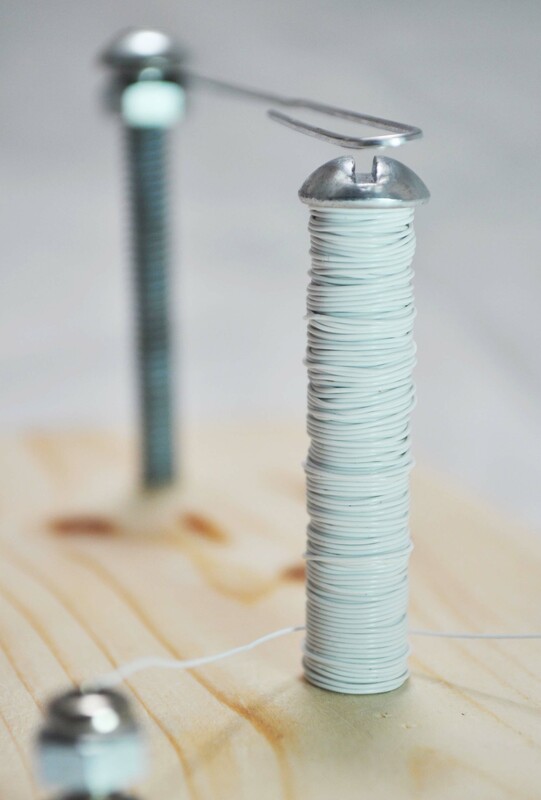 The connecting posts are made of spare bolts screwed directly into the wood base, with nuts and washers to hold the wires in place. The telegraph key is shown in figure 4. 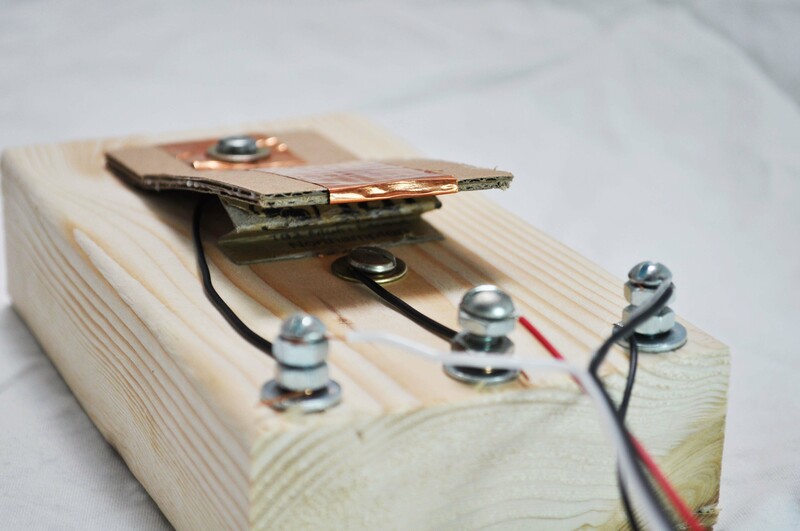 It is comprised of a switch and a 9V battery connected in series. The switch is a piece of cardboard wrapped in copper tape (aluminum foil would also work) and screwed down at one end. The other end is held off the base by a paper spring made from a business card folded accordian style. Underneath the cardboard is another bolt that serves as the connection point. A pair of long wires connect the key to the sounder. The best activity for this device is to play with it. Put the key and sounder in different rooms, or around a corner from each other, and let students send messages from one to the other using Morse code. Morse code dictionaries are available in many places, but aphaits at deviantart.com has made a very nice version for personal use. Students should work in teams, with some students transcribing and others translating, some sending and others receiving. The difference between dots and dashes can be quite hard to hear, and it may be easiest for students to get down close to the sounding arm to watch it as it moves. Alternatively, you can hook up a light bulb in parallel with the sounder so that a light goes on at the same time as the electromagnet. You'll want a light that's rated for 9V. Many car lamps satisfy that requirement, and flashlight lamps can be found rated for 7.5V or 12V (close enough). 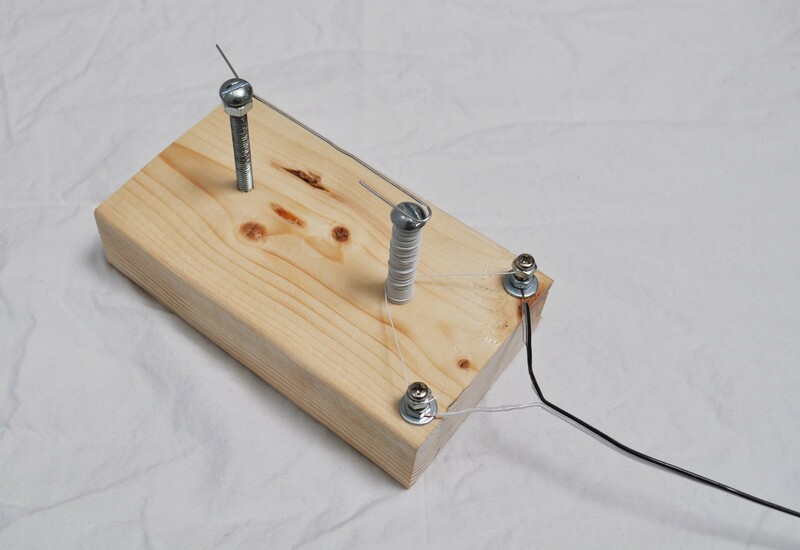 Older students may enjoy building the telegraph themselves from scratch. Allow 2 to 4 hours for them to put all the pieces together. It's helpful to have an ohmmeter at hand to test the connections. Introduce the two parts of the telegraph separately. Start with the sounder to explain that it is really just an electromagnet that attracts the paper clip to the head of the bolt. Demonstrate by connecting a 9V battery directly to the sounder and listen for the paper clip to hit the bolt. You should get a good ring. Then ask students to imagine how this would work to send a long-distance signal. Ask them to imagine the wires connecting the battery as really long. Finally, show students the key and connect it to the long wires. Ask them to explain how pressing the key will allow current to flow to the electromagnet. The history channel offers a brief history of the telegraph at http://www.history.com/topics/telegraph. A former railroad telegraph operator shows off his wonderful collection of telegraph equipment at Jim's Antique Radio Museum. A timeline of important dates in the history of the telegraph is available at About.com.